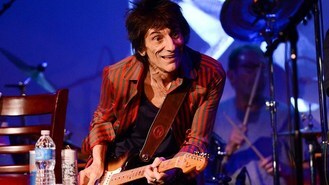 Hours before Stones guitarist Ronnie Wood took the stage with former band member Mick Taylor at a club in Manhattan on Saturday night, a crowd gathered outside amid speculation that they would be joined by fellow guitarist Keith Richards and, possibly, Mick Jagger. Inside the Cutting Room was a mix of celebrities - musician and actor Steven Van Zandt, Monkees member Micky Dolenz, fashion designer Tommy Hilfiger, among others. A 90-minute set of guitar-grinding Jimmy Reed blues songs from Wood and Taylor. The duo played a few shows at the club earlier in the week, too, tearing into the likes of Bright Lights Big City and Going to New York.